When you arrive at the Takshanuk Trail, your knowledgeable guide will instruct your family’s driver on how the Kawasaki Mules operate. If you prefer not to drive it’s no problem. We can accommodate those who just want to enjoy the ride! You will be provided with a safety briefing and details about navigating the trail so that your family has the best Alaskan experience. The mules are equipped with convertible tops for those traditional Southeast Alaska days and your guide can provide you with blankets, gloves, ponchos, or rain jackets to insure your comfort. Start your journey up the trail and enjoy the lush forest and scenic views peeking through the trees. The first mile of trail has 17 switchbacks and gains the most elevation, starting at sea level and taking you to 1100ft elevation for your first stop at our exclusive mountain lodge. Your first stop includes breathtaking views of the beautiful Lynn Canal, Lutak Inlet, and Coast Mountain Range. 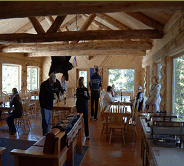 At the lodge you are treated to fresh, out-of-the-oven cookies, coffee, hot chocolate, hot tea, and lemonade. Restroom facilities are available. After the lodge you journey another scenic mile of trail with views of cascading waterfalls and beautiful Tongass National Forest. Your next stop is at the scenic Alpine Lake. This natural lake is fed by the many waterfalls cascading down Mt. Ripinsky. When the season is right, guests can take a moment to sample wild Alaskan blueberries! 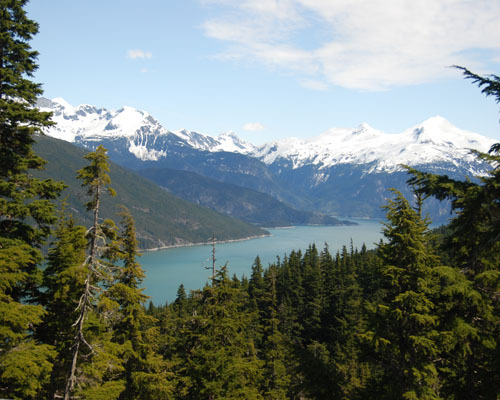 As you continue to the end of the trail at 1500 feet, be prepared to catch your breath for the stunning vista of Chilkoot Lake and the Upper Lynn Canal. The return portion of your tour will take you back to our Rustic Cabin where you will indulge in a deliciously prepared halibut and BBQ chicken meal. Vegetarian meals and any other special diet or meal requests are available with a 24-hour notice. Our machines can seat two to five guests. Guests must be 21 years old to drive and have a valid driver’s license. Families and groups are kept together on their machines and are offered many stops along the trail to alternate drivers if so desired. For those who took the Takshanuk Trail bus to the trail head, your return trip to town will include a short, scenic tour of Haines and Fort William H. Seward, the first permanent army base in Alaska. For an even better idea of what to expect on your tour, view our Video and Photo gallery for Scenes From the Trail. We are glad to have you as our guests and look forward to your return visit! The Kawasaki MULE™ 3010 utility vehicle is similar in concept to a four-wheel-drive pickup truck, but its deliberately rugged design and smaller size enable it to maneuver into places that are normally inaccessible to full-sized vehicles. While at our exclusive lodge on Takshanuk Mountain, enjoy a delicous meal of Beer-battered Halibut, BBQ Chicken, Roasted Potatoes, Homemade Slaw, Homemade Tarter Sauce, Fruit Salad and Fresh Baked Cookies! The trail was constructed in 2003. You can drive about six miles of trail (RT) all the way to 1500ft. There are many look outs and photo opportunities! Our motorized, guided tour allows you to get in touch with the serenity of nature and be captivated with some of the most pristine views Alaska has to offer!